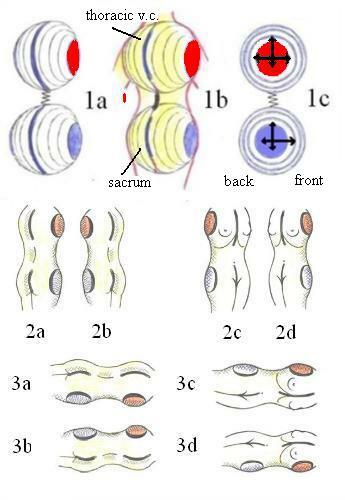 Thorax and pelvis can be presented as two spherical bodies (1a) connected by a spring, allowing bending, some shifting and some rotation as described in T49. The arrows in fig 1c present the extent of movements of clavicle and femur. (For the clavicle they are about 30 degree for forth and back, 45 degrees for up and about 10 degrees for down movements, for the femur 35 degree for inside-, 15 degree for outside-rotation, 10 degree for adduction and about 40 degree for abduction. Red areas in figures 1a, 1b, 1c present the "zero"- or neutral-position of the shoulder (deltoid) and blue areas the "zero" or neutral position of the hip (trochanter mayor). Figures 2a and 2b show a lateral-back view, figures 2c and 2d a lateral-front view of thorax and hip in vertical position, figures 3a to 3d present the same positions but horizontally. In figures 2a and 2b the border of the shoulder and the hip nearest to the eye (marked) present as "parallel" or " in line" with the thoracic vertebral column and with the sacrum. In figures 2c and 2d the border nearest to the eye present as "parallel" or " in line" with the thoracic and abdominal mid-line. 1. In regard of hip and thorax: The corresponding mid-lines of hip and thorax present always as of similar configuration and as "in-line". 2. In regard of border-lines of the shoulder or the hip in "zero" or neutral position: The part of the lines nearest to the eye present always as parallel to the hip or thoracic mid-line the view is directed to. Occasionally the rotation in-between thorax and pelvis appear to be more than 15 degree reaching even near 90 degree. This effect is not due to excessive rotation of more than 15 degree in-between hip and thorax, but due to movements of both clavicles and femurs. For illustration see T54. Before starting any figurative work it may be worthwhile to make some basic assessment of the relation of the position of thorax and pelvis, the positions of the two deltoids and trochanter, and the direction and rotation of the limbs involved.